It's so hard not to prejudge a movie, especially in this day in age. How can you NOT have some preconceived notions about a film when the trailers and TV ads show you every single plot point and, in some cases, actually give away the twist endings. And in this information-soaked age of the internet, the **SPOILER** bug is out in full force. If you don't want to know what happens in a movie, either you go to the theater on opening weekend (or a "Sneak Preview", just to be safe), or pull a Howard Hughes until it comes out on DVD (and with that quip, I've now ruined "The Aviator" for some unsuspecting reader. I apologize). My point is, I had prepared myself to be bored out of my mind when I popped "Battling Butler" starring Buster Keaton into the DVD player. Take a look at that date... we're talking about the "Silent" era here. Title cards and organ music. That coupled with an aversion to slapstick, AND being informed via IMDb (I couldn't help myself!) by Keaton-enthusiasts that this wasn't Buster's best work had my thumb poised over the Fast Forward button. But I was pleasantly surprised. Arthur Butler (Keaton) is a coddled little snob. His father wants him to "become a man", so he orders Arthur to take a hunting and fishing trip, in the hopes that the experience will toughen him up. Arthur packs up everything (INCLUDING the kitchen sink) and he and his valet (Snitz Edwards) head out into the wilderness. The usual "fish-out-of-water" stuff ensues; Arthur trying to shoot the surrounding wildlife, some hi-jinks out on the nearby stream, the problems associated with setting your tent up in a mud pit. During his misadventures he happens to meet a pretty young lady (Sally O'Neil) whose family lives nearby. Despite nearly blowing her away with a shotgun on 2 separate occasions, the girl and Arthur hit it off and eventually fall in love. 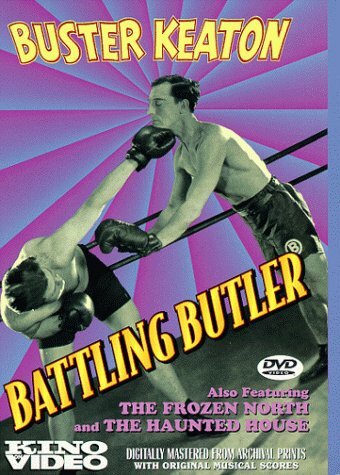 During their courtship a minor plot point comes to light (with the subtlety of a foghorn): a boxer named Arthur "Battling" Butler is challenging the lightweight champ this coming weekend. Quite a coincidence, eh? But I'm sure it won't come up again. Anyway, Arthur's plans to marry the mountain girl hit a snag once he meets her hulking father and brother. They don't want any weaklings in the family, and Arthur doesn't look up to snuff. So, in a misguided attempt to save the budding romance, Arthur's valet tells the mountain men that Arthur is, in fact, the "Battling" Butler who's challenging for the lightweight crown. And it's the fantastic efforts of Arthur and his valet to deceive the mountain girl and her mountain family that drives the second half of the movie. Admittedly, this is a one joke plot convention. But Keaton and his supporting cast (particularly Snitz Edwards) do enough with it to keep it entertaining for the remaining 35 minutes of this one. It's their ability to do it with purely physical comedy (of both the slapstick and more restrained variety) that really raised my opinion of the film. Normally slapstick will only elicit a polite giggle from me, more out of support for the effort put forth rather than the presence of humor. Keaton's stonefaced non-reaction to everything was his bread and butter, and it definitely had me laughing in earnest. And the more broadly physical comedy (particularly the driving stunts) definitely stroked that same area of my brain that has me mesmerized by the antics on MTV's "Jackass". Somebody ought to think about re-marketing these old Buster Keaton classics to the Johnny Knoxville-set. There's a definite neural connection between laughing at Steve-O getting his eyebrows waxed off and Buster Keaton getting pummeled. The slapstick boxing footage is the heart of the movie. Arthur eventually resorts to taking the real "Battling" Butler's (Francis McDonald) place during training, and he's as ill at ease in the ring as he is in the forest. First and foremost is everyone's willingness to take and give punishment. I had a combination laugh/flinch going on while I watched Arthur getting beaten up by his sparring partners. I've definitely seen some recreations (read: stealing) in other movies of Keaton's coping with the confusion of the ring ropes by sliding underneath them on his belly. For some reason the scenes where Arthur, his valet, and his trainer (Tom Wilson) do some roadwork had me laughing. There's a subtle moment where Arthur and the valet are distracted by an accident on the side of the road and stop to gawk, but just the site of his trainer gets his legs pumping in an almost involuntary response. Arthur's willingness to follow his trainer's advice to a fault was hilarious as well. And finally, I have to give credit where credit is due; every other movie that features a novice in the boxing gym features at least one scene with the speed bag. It's absence here raises the mark a bit. P.S. - For some reason the Battling Butler's final opponent, the Alabama Murderer, wasn't listed in the credits. He looks VERY familiar to me, but I cannot place his face. His menacing appearance (and less that "movie star quality" looks) has me convinced that this was a cameo appearance by a real boxer, but some research of the lightweights of the era has turned up nothing. If any boxing/Keaton historians can give me a hand, please e-mail me! While the premise was stretched a little thin at 71 minutes, I really enjoyed this film from a bygone era. I was able to put aside all of the Silent Era prejudices I listed above (along with numerous others: the creepy "kabuki" style make-up jobs, rampant overacting, the disturbing appearance of anyone in black-face) and just take this for what it was. A light diversion from reality. And my enjoyment of the more understated aspects of Keaton's performance is just further proof of my impeccable sense of humor. Now please excuse me while I laugh like a hyena watching Johnny Knoxville take multiple shots in the groinal region from a group of pre-schoolers.